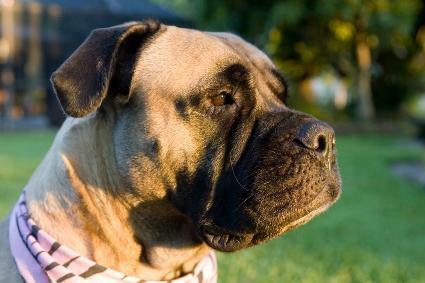 The Bullmastiff is one of the largest of all dog breeds. Learn more about how this giant was developed and what you might expect from one as a companion. The Bullmastiff we know today is the result of breeding Mastiffs to Bulldogs. The purpose behind this cross was to produce dogs of great size who displayed the tenacity and courage of their Bulldog ancestors. Early specimens were used to accompany gamekeepers on their rounds, helping them to track and catch poachers on their property. This early occupation gained the breed a reputation as being a bit fierce, a perception that still lingers today. However, it should be noted that these dogs are generally reliable companions within their family setting, affectionate and docile under normal circumstances. The Bullmastiff is a powerfully built animal with enormous muscles that produce a fairly intimidating first impression. His size might lead you to believe that he would be a bit cumbersome, but he's actually quite capable of great speed and agility if the situation calls for it. The eyes of this breed are both soulful and keenly intelligent. The head and neck areas carry folds of flesh that aid these dogs in scent detection. Height- The average specimen stands approximately twenty-seven inches tall at the shoulder. Weight- Bullmastiffs weigh in between one-hundred, and one-hundred and thirty pounds. Coats on this breed are quite short and generally carefree. A simple brushing with a dense bristle or rubber brush will remove dead hairs and most debris.The loose jowls do produce a significant amount of drool, so keeping a towel handy is useful for wiping it away. All colors carry a black face mask. The Bullmastiff is very calm and devoted to its human companions, and also very protective. The breed makes very good guard dogs since they are not easily intimidated by intruders. The sheer size of this breed does present a few challenges to ownership. First, they are not the ideal companions for children, who are simply too small to control these dogs in all situations. Play should always be supervised by an adult that the dog will respond to. Second, Bullmastiffs must be thoroughly socialized as young dogs to overcome some of their excessively protective traits. They must also be exposed to other household pets from puppyhood if they are to accept them as part of the family. For all of these reasons, it's highly recommended that owners enroll these dogs in obedience school as youngsters. Gastric Torsion, often referred to as "bloat"
Owning one of these powerful dogs is not for the timid. It's a wonderful breed in the right hands, but unless you are confident of your superior role in the relationship, you may find your dog has taken on the Alpha role, and you are his follower.If you find you can't resist this beautiful breed, then you should do a good deal of research before you make a purchase. Find one or two professional breeders who are willing to take you under their wing and teach you what is required to own one of these dogs. You should be able to spend time around adult dogs as well as puppies so you can make an informed judgment about how a Bullmastiff will fit into your home and your life.